"By in large we were faithful to the book, but there are a few zigs and zags and a couple of twists in there that the book readers will be surprised by," Kelley tells THR. The premiere of the Reese Witherspoon-Nicole Kidman and Shailene Woodley drama Big Little Lies starts off with a bang. Literally. Somebody is dead. In fact, that's even the title name for the episode. The opening scene of the series starts with a crime scene, there are police lights flashing, caution tape, a mention of a deceased victim and testimonies from various witnesses talking about what really went down during that fateful night of fundraising. While this scene is meant to set up a murder mystery, Big Littles Lies writer and showrunner David E. Kelley tells The Hollywood Reporter he hopes viewers look beyond that. "It's not necessary to us as storytellers for this to be hinged entirely on, "Who done it?" That's one component of it, but the stories we access as we go along are really the nucleus of the series," says Kelley. The opening scene in fact is used as a vehicle for something else entirely. "We almost beg the audience to judge it negatively and say, 'Look at this superficial place and these people with nothing to worry about, walking around worrying.' Then as we probe the place deeper and the characters themselves you realize it's not always so pretty." Kelley, who is also an exec producer on Amazon's recently renewed Goliath and the upcoming TV adaptation of Stephen King's Mr. Mercedes, talked further with THR about Big Little Lies' series premiere, changes made in adapting the book of the same name and working with HBO. You have said that adapting Liane Moriarty's book was both easy and challenging with the easy part being you staying faithful to the story. What changes though did you feel were important to make? There were no fundamental changes that needed to be made. The architecture of the plotting was very good. The characters were well crafted. My main goal was to live up to a lot of the execution in the book. The biggest challenge was tonal. There was a mix and match of both comedic and dramatic elements. It was important as we told the story that we keep the audience leaning in, wanting to know what's going to happen next dramatically and not letting the comedy dilute the dramatic impact of the show. That was always a tightrope walk. The other challenge of course was you can't keep it all. You've got to make judicious choices on what part of the book is going to survive and what part isn't. In terms of story points, there was just one big character arc that was added in the middle, but I don't feel it fundamentally changed the book, it just complicated the character in question. By in large we were faithful to the book, but there are a few zigs and zags and a couple of twists in there that the book readers will be surprised by. What are the themes that Big Little Lies is trying to explore? First and foremost, love and relationships. Beyond that community, friendship and also loneliness. These characters, all of them are still in search of themselves. Who they are and what their respective nuclei are. It's about self-discovery. In terms of the dramatic plotting we're looking at the carouse of the fact that a tragic event can have on people. How do you hope these stories will impact the portrayal of women on television? I know Reese and Nicole were more of the guardians on that question. I was really just paying attention to this world and these characters and trying to be true to who they were. I was less mindful of what message I would be sending out to women kind, beyond. I know Reese and Nicole have very strong opinions on this. It's one of the reasons they optioned this book. It had so many strong female characters that in addition to it being great storytelling it really did set a fine example of how shows being powered by women, carried by women characters could be compelling, funny, viable and addictive. The series premiere starts with a crime scene. How important was it for you to have this be the immediate starting point to the series? It's pretty important. As we meet these people and we're introduced to this world we almost beg the audience to judge it negatively and say, "Look at this superficial place and these people with nothing to worry about, walking around worrying." Then as we probe the place deeper and the characters themselves you realize it's not always so pretty. What comes off initially superficial is a little more serious. Starting off with a murder let's the audience know right off the bat that something of a severe nature is going to happen. It helps us establish a plot that's going to occasion the audience to lean in and wonder what's going on here. We don't know who's dead, we don't know who did it and we don't know why. But we do want to convey the message to the audience that some tough stuff happened here and now we're going to explore the what and the why. Right after the opening scene the first main character, Madeline is introduced. Having her introduced right after the crime scene seemingly makes her a prime suspect to the audience. How will her story change throughout the series? Will the audience continue to suspect her? I wouldn't be surprised that people suspect her because the focus groups we've had and the internal feedback is that people suspected a multitude of characters right from the get-go. It's Bonnie that has a line, "We don't see things as they are we see things as we are." That's going to be true of our viewers. Everyone is going to see something different in these characters and relate to some more than others, draw judgments more positive than negative on some more than others. Hopefully there's a character for everybody. And it's all up for grabs who you suspect and they why. We try to preserve that suspense until the seventh hour. How do you think audiences will react to not revealing the murderer or possible victim until the seventh episode? I'm hoping the murder mystery is effective in it of itself. But really what it is is a device for us to explore these relationships and these characters. We're hopeful that people are hooked by the murder mystery component of the series, it's a big part of the series, but if one is not we're equally hopeful it's not fatal because what this murder is is a spring board to really probe a lot of the frailties and flaws that lie beneath within the people that populate our town. It's not necessary to us as storytellers for this to be hinged entirely on, "Who done it?" That's one component of it, but the stories we access as we go along are really the nucleus of the series. What was the most difficult scene to write for the premiere? No scene jumps out at me. The trick of any pilot or premiere episode is giving the audience a sense of all the characters and also establishing the dramatic through line. It's a lot to get up and running in one episode. I actually feel that the series builds with each ensuing episode. It gets deeper and more engrossing. The first episode, the main challenge is you can run the risk of having a little too much of everybody and not enough of anybody. That's always the challenge with the multitude of characters in this particular project I would say that hurdle was a little bigger. It did help knowing who I was writing for and being able to mine Celeste and Madeline right away knowing the rhythms and nuances and personas of Reese and Nicole a little bit. Shailene came on board pretty early so I had her in mind as we configured that character. We also had a really strong director who was very sure footed on who these people were and what this place was. Was there one character that you especially enjoyed writing for? I do think Madeline is really fun to write just because she's such a dynamo motor-mouth. You've never met a patch of dead air that she can't quickly fill. Celeste is very reserved and guarded. Jane is also private and keeps her own counsel. Which characters may have more secrets than what was revealed in the premiere? There are pretty strong pivots for all three of them, Madeline, Celeste and Jane. I would have to go back and tally the score card, but they all have some pretty dramatic turns. I'll leave that to the viewer and you! How has doing the show for HBO compared to working on Goliath for Amazon and Mr. Mercedes for AT&T's Audience Network? We're just starting to get into it with AT&T and so far, so good. We got terrific talent attached to that too including Brendan Gleason and Mary-Louise Parker so that's very exciting. But with HBO, that's as good as it gets. They're professional, they're adults, they've been doing this a long time and they're everything they've been cracked up to be. It's my first experience working with them and I would love to work with them again. Big Little Lies airs Sundays at 9 p.m. on HBO. 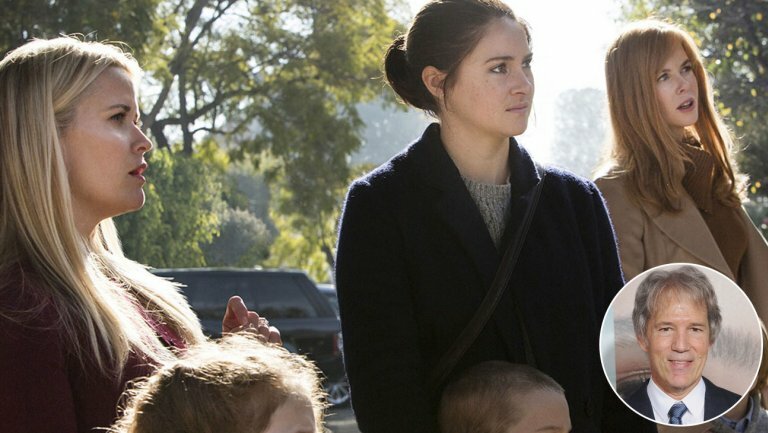 What did you think about the Big Little Lies premiere? Was the premiere faithful to the book? Which character is holding on to more secrets? Sound off in the comments section below and stay tuned to The Live Feed for more Big Little Lies coverage. Most TV pilots have to do a decent job of setting up the story to draw people in: With its cinematic cast, Big Little Lies doesn’t have this problem, because the HBO audience would probably watch Nicole Kidman and Reese Witherspoon play checkers for seven hours. But Big Little Lies goes a step beyond by casting these very familiar faces in housewife and mother roles, adding glamour to what could be a typical domestic drama, amid an idyllic landscape that the rest of us puny humans can only dream about. While the novel the series is based on by Australian author Liane Moriarty, was an extremely enjoyable airport read, HBO’s production, written by David E. Kelley and directed by Wild and Dallas Buyers Club’s Jean-Marc Vallée, adds layers of sophistication that the book lacks. The soundtrack, the interwoven investigation, the shots of the surging sea—even the talking heads talking smack about Madeline and her friends have much greater resonance than the pull quotes that were used to kick off Big Little Lies’ chapters. By playing up the crime at the center of this Monterey drama, Big Little Lies grips the viewer even before the stars show up. But when they do, it’s extremely satisfying. Witherspoon’s Madeline appears to be Election’s Tracy Flick all grown up, now saddled with an unappreciative teenage daughter, an ex-husband with a beautiful new yoga teacher wife, and a first-grader who’s already growing up too fast. Her husband Ed is played by Adam Scott, but could be played by anybody in this pilot, as he doesn’t do much more than comfort Madeline’s insecurities. Laura Dern’s Renata is Madeline’s opposite and her enemy, an unpopular working mom who just joined the board of PayPal. Nicole Kidman plays Celeste, Madeline’s best friend, a beyond-beautiful former lawyer and the mother of twins. And Shailene Woodley is Jane, the mysterious young stranger who enters all of their lives. There’s a wealth of dramatic material available in any first-grade classroom, but outside of The Slap, Big Little Lies appears to be the first show to explore it with great fervor. Because everything those talking heads are saying is right. You can’t get more bananas than an elementary school fundraiser. There’s always the possibility of tension between working moms and those who stay at home. Parenting brings with it all sorts of unexpected social shifting and anxieties, for kids and parents both. But it’s the job overall that’s the hardest, as Witherspoon effectively conveys in this episode’s most poignant scene. Madeline tries to describe to her older daughter just why it’s so hard to see her grow up: It’s because the little girl she used to take such close care of is gone. The job she’s spent the last 18 years doing—raising this child—is about to be over for good. These performances elevate Big Little Lies from airport fodder fiction to a prestige event, even though there’s lots of trashy fun to be had. The sniping between the moms, the mysterious backstories, the pieces that slowly get put into place: It all adds up a hypnotic package. Even better: Big Little Lies’ glossy finish points to the falsehood of the perfect life: Of the three leads, Celeste’s life appears to be the most outwardly pristine, and we already learn that her relationship with her husband may be tinged with violence. Which domestic palace will start to crumble next? Who is Jane running from on the beach? How dark will Celeste’s relationship get? Who got killed and why? There’s no way we won’t be turning in every week to find out. Welcome to the world of Big Little Lies weekly reviews! Very excited to be here, I have been jonesing for this show since its first previews. Important question to ask: Did you read the novel? I have, and I loved it, but I wish I didn’t know the details about the show’s focal murder going in. I was also unable to put down Moriarty’s The Husband’s Secret. That said, if you have read it, please keep all spoilers to yourself in the comments. Best mom outfit: Madeline’s first day of school floral print dress, matching cardigan, and Mary Janes that injure your foot. Big Little Lies debuted on Sunday night with a crime scene. The premiere of the HBO mini series, adapted from the book by Liane Moriarty, introduces the re-envisioned town of Monterey, California, in the wake of a murder at a fundraiser. While the identity of the homicide victim is left a mystery for the show's opener, fans are introduced to the main characters and zeitgeist of the town. Reese Witherspoon's character Madeline is a meddler and leader among the rich mom's of her town. While Nicole Kidman (Celeste) is the mother of twin boys and has a very PDA heavy marriage with hunk Alexander Skarsgard. But newcomer to the town, Jane, played by Shailene Woodley, is different than the other moms, she is younger and much poorer. The plot kicks off when Renata, played by Laura Dern, claims Jane's son Ziggy hurt her daughter Annabella at school. The claim creates an instant feud between the two moms, with Jane defending her son's innocence. Renata also has other troubles, with her ex Nathan and his new younger wife Bonnie, played by Zoe Kravitz, creating tension in her already complex life. However, the show really kicks off when Celeste's affectionate marriage turns violent after her husband forcefully tugs at her arm, spelling not all is well in the idyllic town of Monterey. Big Little Lies sees the season opener provide another chilling image when Jane takes a revolver and places the handgun under her pillow, planting the seeds that more violence is afoot. 0 Response to "'Big Little Lies': David E. Kelley Breaks Down Murder Mystery and Biggest Book Changes"